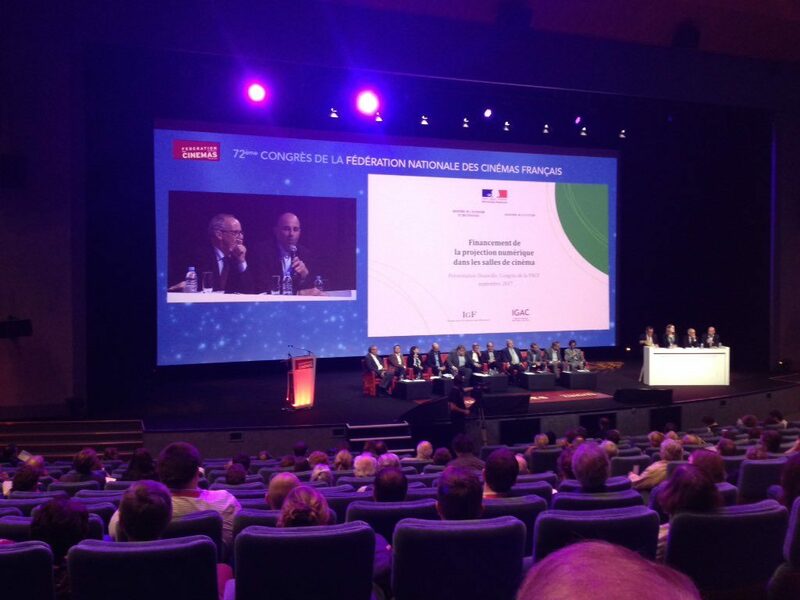 The 72nd annual FNCF convention of French cinemas launched today with a heated discussion about the benefits of digitisation and virtual print fees (VPFs). 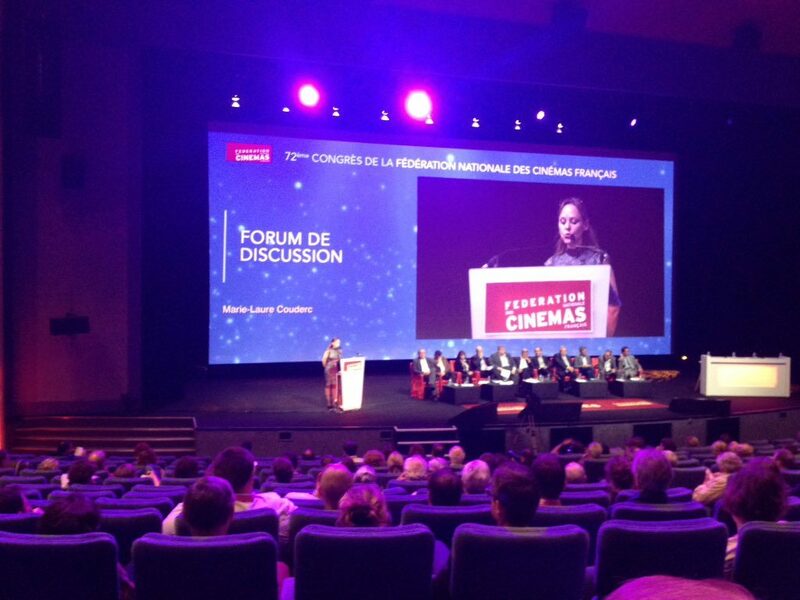 The Congres de la Federation Nationale des Cinemas Francais (FNCF) held in the seaside town of Deauville is the largest country-specific cinema convention in Europe, almost rivalling CineEurope in size. Yet the focus, issues and arguments are very much French-specific. The event was opened by Richard Patry who welcomed all delegates and thanked the sponsors, with the great hall equipped with Barco and Christie laser projectors, the former capable of showing EclairColor HDR, as well as being the largest/only conference hall in the world with a permanent Dolby Atmos speaker installation. There is major presence and support for the event from Ymagis, which is showcasing EclairColor in its home market, having just crossed the 100th install with Almo Drafthouse in Texas, its first in the US. After the welcome and a moment of silence for the members of the French cinema community who have passed away in the last year, Patry welcomed to the stage speakers for the different groups representing small, medium and large cinema operators. Each one gave their own state-of-the-industry presentation, with some overlap in terms of subjects, such as piracy, digital cinema upgrades, windows and PVoD, but also crucial differences. “Why attach something that is working,” asked Marie-Laure Couderc, President and CEO of C2L, speaking on behalf of mid-size cinema chains with regards to premium video-on-demand, pointing out that cinema is not just the first window but the largest contributor to the lifetime earnings of a film. The largest and semi-standing applause were reserved for Laurent Coet (Cinéma le Régency), speaking on behalf of the smallest cinema operators, highlighting that the audience for the FNCF consist of a larger number of small cinemas than one typically sees at international shows like CinemaCon or CineAsia. The Forum de Discussion on the inaugural day saw the presentation of two reports relating to digital cinema and its implication. Digitisation may be a fait accompli, but in France the topic still provokes heated debate and controversy. 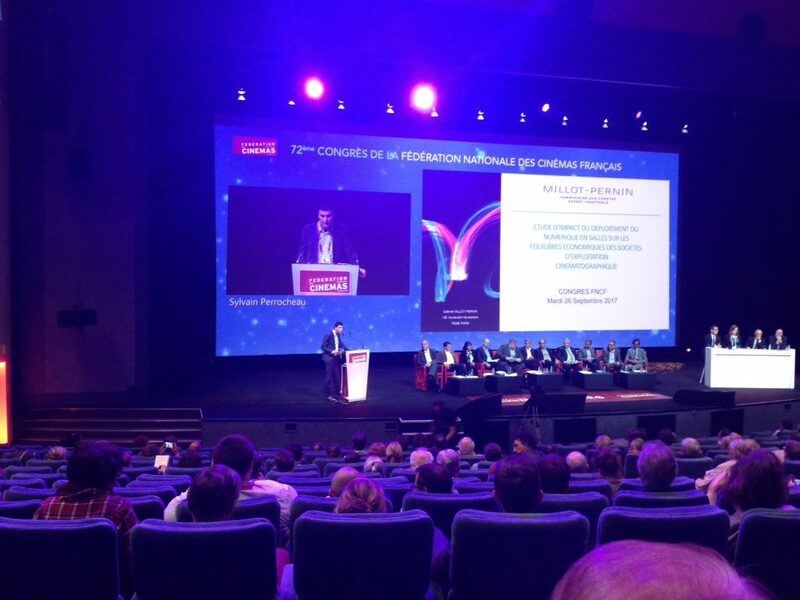 The first report by IGF-IGAC published earlier this year is called ‘Financement de la Projection Numerique dans le Salles de Cinemas‘. This study involved 88 distributors and 888 cinema operators [do they know that the number eight is considered auspicious in China?] looking at the implication of digitisation and VPF, as well as making several recommendations going forward. It examined too many issues to be summarised here, but found that partly as a result of digitisation, the number of films released in French cinemas between 2006 and 2016 increased +22% while the proportion of French films rose +50%. The second report was presented by Sylvain Perrocheau of audit consulting firm Gerant Cabinet Perrocheau. This report surveyed 42 cinemas representing 262 screens, divided between different size cinemas and multiplexes. It compared quantifiable financial values pre- and post-digitisation in the years 2007-2008 and 2014-2015. It found that digitisation had given cinemas an average annual financial boost of 8,700 euro, based on a number of factors. Of the cinemas surveyed 38 (91%) had seen a positive financial benefit from lower electricity use, personnel savings, etc. Just three sites (7%) had seen a negative financial impact post-digitisation, while one site (2%) had seen no impact. The findings were questioned in the Q&A discussion that followed, but FNCF and its auditor consultants appeared to have done a thorough job in the group of cinemas sampled. Other topics covered included a presentation by Odile Tarizzo of regulatory changes, the signing of a new agreement regarding employment rights of cinema employees, as well as a new framework of job classifications and an increase of the minimum wage for cinema staff – +0.85% in 2017 and +0.25% in January 2018. The announcement that the short film festival La Fete du Court Metrage will have the new dates of 14-20 March 2018 and the ‘Extra Court’ scheme to show short films before feature films in cinemas. The 160-minute ‘Discussion’ session was followed by the first of the show’s EclairColor HDR demonstration; a remarkable number of people stayed instead of heading for the bar or the beach. The next two days will see further technology and content demonstrations from EclairColor (including at least two French films screened in the HDR format) and Sony’s CLEDIS screen, as well as trade show demos of Philips LightVibes at CGR’s ICE, cinema software for POS and TMS, and the lingering smell of popcorn that is inescapable at any cinemas trade show. But amongst all the talk of “son en relief”, “format enveloppant”,”ruptive technologie” and “VPF solidarite” there is a sense that the next generation of cinema technology change/innovation/disruption threatens to further challenge the cherished balance that underpins cinema in its country of birth.